It was a very long, all day meeting with people from abroad. I was there to add heft to a somewhat indifferent group of people. The subject was creativity and how to mobilize it so I had some investment in the proceedings and got involved in the proceedings. Still, to keep my attention, I did what I always do: use the added stimulation of drawing to keep my mind from wandering. And, so this drawing was made. It seems an odd thing to do, to do one thing to keep attention on another. I did not do it in school. Rather, I took notes which did the same thing although drawing works better for maintaining attention and retention, at least for me. As for the drawing, it is about form and light. And, it’s evidence that fancy materials are not needed to make art. 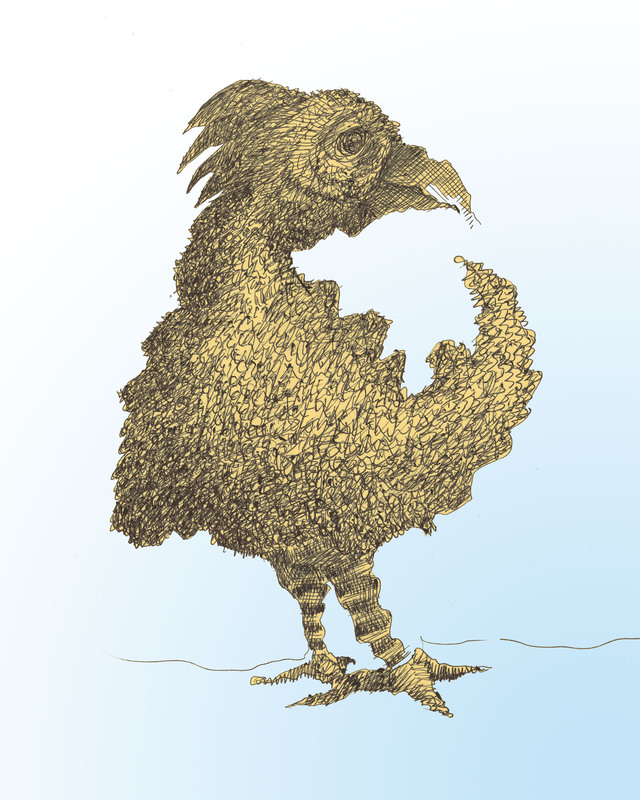 But, I see it as a very aristocratic rooster-type creature. And, a carnivore. This entry was posted in Uncategorized and tagged drawing, small work. Bookmark the permalink.